September 30, 2017 - The TC15 LAB (15A, 20V) is an ultra-stable digital controller for thermoelectrics and resistive heaters where tight temperature stability is required. Designed using the latest technology, stability better than 0.0009 °C can be achieved with thermistors. Precision temperature control is required in myriad applications. 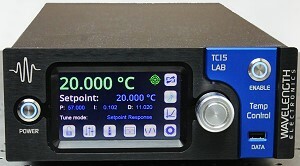 This high‑powered controller makes development of complex systems or sophisticated experiments possible in biological sample control, laser diode or quantum cascade laser wavelength stabilization, spectroscopy, remote sensing, imaging, aerospace, communications, materials processing, pharmaceutical manufacturing control, environmental sensing, electro-optics, and more. Wavelength Electronics solves problems for researchers and OEMs that use high precision laser diodes, quantum cascade lasers, and thermoelectrics. For 25 years, we have led the laser control industry by simplifying advanced control for demanding electro-optical applications. Laser safety is paramount and protection is built into every module. Quality manufacturing consistently delivers high performance reliable product when you need it. Team with Wavelength to beat your competition in performance and delivery.